Surgical Simulation and Medical Training. Engineering as it finds its wide range of application in every field not an exception even the medical field. One of the technologies which aid the surgeons to perform even the most complicated surgeries successfully is Virtual Reality. Even though virtual reality is employed to carry out operations the surgeon’s attention is one of the most important parameter. If he commits any mistakes it may lead to a dangerous end. So, one may think of a technology that reduces the burdens of a surgeon by providing an efficient interaction to the surgeon than VR. Now our dream came to reality by means of a technology called “HAPTIC TECHNOLOGY”. Haptic is the “science of applying tactile sensation to human interaction with computers”. 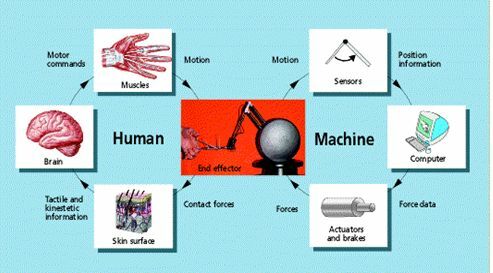 In our paper we have discussed the basic concepts behind haptic along with the haptic devices and how these devices are interacted to produce sense of touch and force feedback mechanisms. Also the implementation of this mechanism by means of haptic rendering and contact detection were discussed. We mainly focus on ‘Application of Haptic Technology in Surgical Simulation and Medical Training’. Further we explained the storage and retrieval of haptic data while working with haptic devices. Also the necessity of haptic data compression is illustrated. Haptic, is the term derived from the Greek word, haptesthai, which means ‘to touch’. Haptic is defined as the “science of applying tactile sensation to human interaction with computers”. It enables a manual interaction with real, virtual and remote environment. Haptic permits users to sense (“feel”) and manipulate three-dimensional virtual objects with respect to such features as shape, weight, surface textures, and temperature. A Haptic Device is one that involves physical contact between the computer and the user. By using Haptic devices, the user can not only feed information to the computer but can receive information from the computer in the form of a felt sensation on some part of the body. This is referred to as a Haptic interface. In our paper we explain the basic concepts of ‘Haptic Technology and its Application in Surgical Simulation and Medical Training’. Force feedback is the area of haptics that deals with devices that interact with the muscles and tendons that give the human a sensation of a force being applied—hardware and software that stimulates humans’ sense of touch and feel through tactile vibrations or force feedback. These devices mainly consist of robotic manipulators that push back against a user with the forces that correspond to the environment that the virtual effector’s is in. Tactile feedback makes use of devices that interact with the nerve endings in the skin to indicate heat, pressure, and texture. These devices typically have been used to indicate whether or not the user is in contact with a virtual object. Other tactile feedback devices have been used to stimulate the texture of a virtual object. PHANToM and CyberGrasp are some of the examples of Haptic Devices. A small robot arm with three revolute joints each connected to a computer-controlled electric DC motor. The tip of the device is attached to a stylus that is held by the user. By sending appropriate voltages to the motors, it is possible to exert up to 1.5 pounds of force at the tip of the stylus, in any direction. accurately measure the position and movement of the fingers and wrist. The CyberGrasp, from Immersion Corporation, is an exoskeleton device that fits over a 22 DOF CyberGlove, providing force feedback. The CyberGrasp is used in conjunction with a position tracker to measure the position and orientation of the fore arm in three-dimensional space. It is a process of applying forces to the user through a force-feedback device. Using haptic rendering, we can enable a user to touch, feel and manipulate virtual objects. Enhance a user’s experience in virtual environment. Haptic rendering is process of displaying synthetically generated 2D/3D haptic stimuli to the user. The haptic interface acts as a two-port system terminated on one side by the human operator and on the other side by the virtual environment. A fundamental problem in haptics is to detect contact between the virtual objects and the haptic device (a PHANToM, a glove, etc.). Once this contact is reliably detected, a force corresponding to the interaction physics is generated and rendered using the probe. This process usually runs in a tight servo loop within a haptic rendering system. Another technique for contact detection is to generate the surface contact point (SCP), which is the closest point on the surface to the actual tip of the probe. The force generation can then happen as though the probe were physically at this location rather than within the object. Existing methods in the literature generate the SCP by using the notion of a god-object, which forces the SCP to lie on the surface of the virtual object. 1. Surgical simulation & Medical training. Training” is discussed in detail below. Human haptics: human touch perception and manipulation. Machine haptics: concerned with robot arms and hands. Computer haptics: concerned with computer mediated. A primary application area for haptics has been in surgical simulation and medical training. Haptic rendering algorithms detect collisions between surgical instruments and virtual organs and render organ-force responses to users through haptic interface devices. For the purpose of haptic rendering, we’ve conceptually divided minimally invasive surgical tools into two generic groups based on their functions. 2. Articulated tools for pulling, clamping, gripping, and cutting soft tissues (such as biopsy and punch forceps, hook scissors, and grasping forceps). A 3D computer model of an instrument from each group (a probe from the first group and a forceps from the second) and their behavior in a virtual environment is shown. During real-time simulations, the 3D surface models of the probe and forceps is used to provide the user with realistic visual cues. For the purposes of haptic rendering of tool–tissue interactions, a ray-based rendering, in which the probe and forceps are modeled as connected line segments. ‘Modeling haptic interactions between a probe and objects using this line-object collision detection and response has several advantages over existing point based techniques, in which only the tip point of a haptic device is considered for touch interactions’. Grouping of surgical instruments for simulating tool–tissue interactions. Group A includes long, thin, straight probes. Group B includes tools for pulling, clamping, and cutting soft tissue. · Users feel torques if a proper haptic device is used. For example, the user can feel the coupling moments generated by the contact forces at the instrument tip and forces at the trocar pivot point. · Users can detect side collisions between the simulated tool and 3D models of organs. · Users can feel multiple layers of tissue if the ray representing the simulated surgical probe is virtually extended to detect collisions with an organ’s internal layers. This is especially useful because soft tissues are typically layered, each layer has different material properties, and the forces/torques reflected to the user depends on the laparoscopic tool’s orientation. · Users can touch and feel multiple objects simultaneously. Because laparoscopic instruments are typically long slender structures and interact with multiple objects (organs, blood vessels, surrounding tissue, and so on) during a MIS (Minimally Invasive Surgery), ray-based rendering provides a more natural way than a purely point-based rendering of tool-tissue interactions. 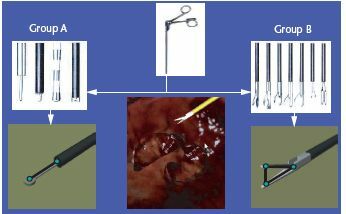 To simulate haptic interactions between surgical material held by a laparoscopic tool (for example, a catheter, needle, or suture) and a deformable body (such as an organ or vessel), a combination of point- and ray-based haptic rendering methods are used. 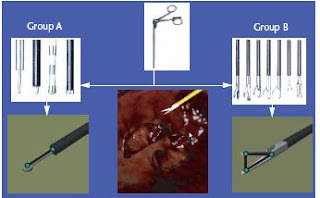 In case of a catheter insertion task shown above, the surgical tools using line segments and the catheter using a set of points uniformly distributed along the catheter’s center line and connected with springs and dampers. Using our point based haptic rendering method; the collisions between the flexible catheter and the inner surface of a flexible vessel are detected to compute interaction forces. The concept of distributed particles can be used in haptic rendering of organ–organ interactions (whereas a single point is insufficient for simulating organ–organ interactions, a group of points, distributed around the contact region, can be used) and other minimally invasive procedures, such as bronchoscope and colonoscopy, involving the insertion of a flexible material into a tubular body . One of the most important components of computer based surgical simulation and training systems is the development of realistic organ-force models. A good organ-force model must reflect stable forces to a user, display smooth deformations, handle various boundary conditions and constraints, and show physics-based realistic behavior in real time. Although the computer graphics community has developed sophisticated models for real-time simulation of deformable objects, integrating tissue properties into these models has been difficult. Developing real-time and realistic organ-force models is challenging because of viscoelasticity, anisotropy, nonlinearity, rate, and time dependence in material properties of organs. In addition, soft organ tissues are layered and nonhomogeneous. In particle-based models, an organ’s nodes are connected to each other with springs and dampers. Each node (or particle) is represented by its own position, velocity, and acceleration and moves under the influence of forces applied by the surgical instrument. In finite-element modeling, the geometric model of an organ is divided into surface or volumetric elements, properties of each element are formulated, and the elements are assembled together to compute the deformation states of the organ for the forces applied by the surgical instruments. techniques captures the hand or finger movement of an expert performing a skilled movement and “play it back,” so that a novice can retrace the expert’s path, with realistic touch sensation; The INSITE system is capable of providing instantaneous comparison of two users with respect to duration, speed, acceleration, and thumb and finger forces. Techniques for recording and playing back raw haptic data have been developed for the PHANToM and CyberGrasp. Captured data include movement in three dimensions, orientation, and force (contact between the probe and objects in the virtual environment). Haptic data compression and evaluation of the perceptual impact of lossy compression of haptic data are further examples of uncharted waters in haptics research. On analyzing data obtained experimentally from the PHANToM and the CyberGrasp, exploring compression techniques, starting with simple approaches (similar to those used in speech coding) and continuing with methods that are more specific to the haptic data. One of two lossy methods to compress the data may be employed: One approach is to use a lower sampling rate; the other is to note small changes during movement. For example, for certain grasp motions not all of the fingers are involved. Further, during the approaching and departing phase tracker data may be more useful than the CyberGrasp data. Vector coding may prove to be more appropriate to encode the time evolution of a multi-featured set of data such as that provided by the CyberGrasp. For cases where the user employs the haptic device to manipulate a static object, compression techniques that rely on knowledge of the object may be more useful than the coding of an arbitrary trajectory in three-dimensional space. We finally conclude that Haptic Technology is the only solution which provides high range of interaction that cannot be provided by BMI or virtual reality. Whatever the technology we can employ, touch access is important till now. But, haptic technology has totally changed this trend. We are sure that this technology will make the future world as a sensible one. Today world is driven by his comment is here, and retail industry is catching up with all the new technologies to keep up their sales and customer satisfaction. There is no stopping now. Sky is the limit.